You only have one chance of making a first impression so make it a good one with one of Victory's stunning uPVC Front Doors. We also offer a comprehensive range of glazing styles and door furniture, allowing us to give you those personal touches to your replacement door whilst security is at the forefront of our brilliant designs, ensuring your home is left safe and sound. 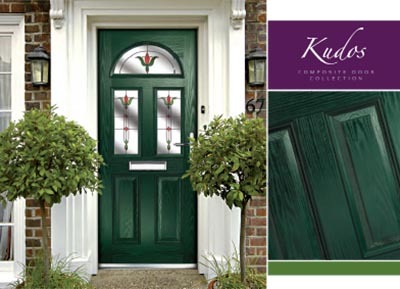 Choose from an extensive range of glazing finishes including Cottage bars, Decorative & Leaded Glass, and you can also add the following door furniture in a variety of finishes: White, Brushed Chrome, Brass, Black and Gold. Consider whether you'd like add Spy Holes, Door Knockers, Handles, Door Chains and a range of customisable features and acessories. Fabricated and Manafactured in the United Kingdom, specifically designed to withstand the somewhat unpredictable weather elements, all of our uPVC Front doors won't rot, warp, discolour or fade and will be fitted by installers who are trained and qualified to the highest standards. A Beautiful set on intricate sliding uPVC Patio Doors will transform the rear of your home, allowing for easy access to the garden whilst filling your home with beautiful natural light and a source of fresh air during the warmer summer months. Improve your energy efficency as an old set of patio doors can be costing you hundreds of pounds a year if they're not up to modern standards. With our Energy A-rated glass, you'll be guarnteed to exceed all modern day standards whilst saving yourself a small fortune in the process. The options for uPVC Patio Doors are endless, you can choose how many panels you would like to slide and in which direction. You can even choose between locking systems and sliding mechanisms too! Quite often we're asked to take out an existing window and replace it with either some larger uPVC Patio, French or Bi-Fold doors, this involves cutting away some of the brick work and then installing the doors. Contact us today on (023) 92 824 006, or leave us a message to speak to a member of our small friendly team about this or any of our other services. French Doors a simplistic yet elegant addition to any home and at Victory Windows, they've never been so affordable. Again, customisable in a wide range of colours, styles and features a set of uPVC French Doors will help transform your home, giving you easy access to the outside. A set of beautiful Bi-fold doors from Victory will transform your living whilst giving your home a real "wow factor." You may choose between Aluminium and uPVC for your new Bi-Fold Doors, both of which have brilliant benefits in abundence. To read more about aluminium doors click here or get an instant online quote for uPVC Doors by clicking here. With a straightforward approach to uPVC Doors across Hampshire, Surrey and Sussex it's no wonder that more and more homeowners from the region are choosing Victory Windows to install their new uPVC doors! Not only do we use the finest products available on the market today but you'll be getting a no hassle, efficent service with no pushy sales people and no commissions, so you'll be getting the best price too! Our replacement doors are designed to surpass even the most stringent security tests with the latest security features, including high security hinges and robust locking system.